New to the Protechmasta collection the SilverAid Leg Wraps have the additional added value of killing bacteria to prevent infection from cuts and abrasions and also bacterial and fungal infections – especially useful for Mud Fever at this time of year. Kill bacteria – Silver ions are released which break down bacteria and prevent infection. 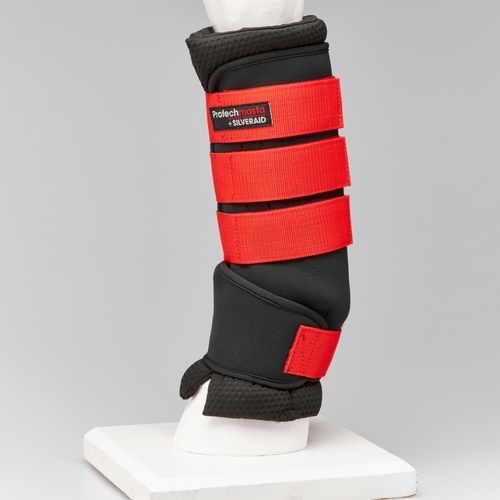 Reduce inflammation – Far infrared will increase blood flow and reduce swelling. Heal sores/cuts/abrasions – Increased blood flow brings vital nutrients and proteins required for cell and blood vessel regeneration. How does Silver and Far Infrared (FIR) work? Silver ions are reactive, charged silver atoms which are attracted to oppositely-charged components of bacterial cells. The ions break these components down, killing the cell and bacteria. The intelligent treatment on the removable liners only release silver ions when bacterial activity is present, making the process more efficient and extending the life of the product. Silver has been used as an antimicrobial agent for thousands of years and the multiple ways that silver ions attack bacteria means that bacteria cannot develop a resistance to it. Far Infrared radiation is emitted by ceramic nanoparticles into the body and reflects the body’s own FIR radiation back into the skin causing blood vessels to widen and blood flow to consequently increase. As blood carries vital oxygen and nutrients, an increase in circulation means that the body can perform at optimum function. Cell growth and organ function is promoted, muscles relax, heart rate lowers, metabolism increases and toxins and waste products are flushed through. Thus giving the body the power it needs to speed up repair.